But the letter is addressed to a "Tonti". So who were Alan and Tonti? 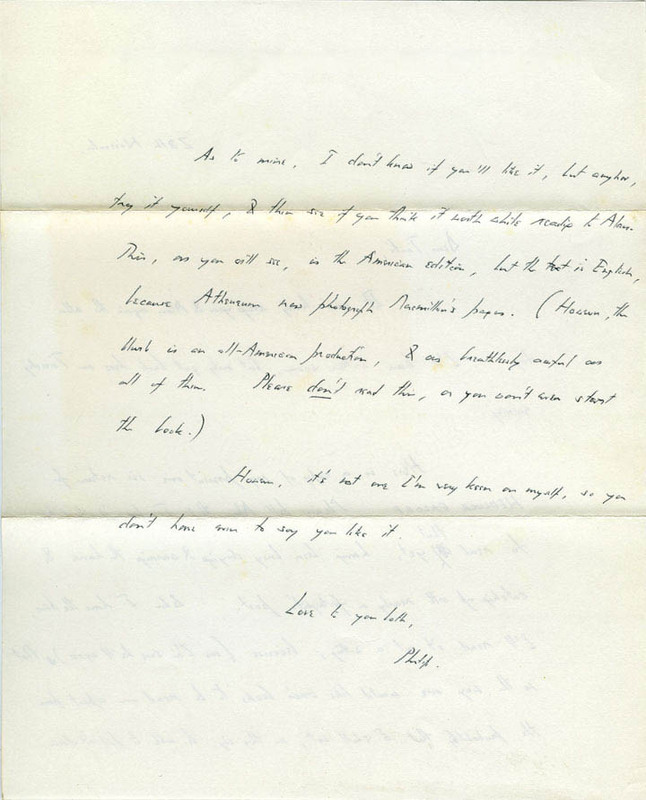 There's a clue in the second paragraph of the letter, where Hubbard writes, "Here is a copy of my present one [A Thirsty Evil] in return for HEMLOCK GALORE." 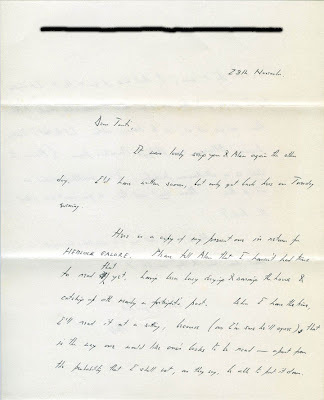 Hemlock Galore is an obscure thriller published by Robert Hale in 1974 by the British author Alan Kennington, so clearly Hubbard is writing to Kennington's wife (whose full name was Constance, maiden name Rycroft – thank you to Steve Holland for that piece of info). There's scant information about Kennington online; as well as Hemlock Galore he appears to have written a number of books in the 1940s and '50s, possibly all crime/mystery/suspense novels. Titles include Death of a Shrew (1937), A Bagful of Bones (1942), and the intriguingly named – and I'm not making this up – Young Man with a Scythe (1951). He also apparently wrote under the alias Alan Grant, although that's difficult to establish properly due to the fact that there's a rather more famous writer named Alan Grant, which makes googling Kennington's pseudonym a bit of a bugger. After explaining that he hasn't had time to read Hemlock Galore yet, having been away and consequently "catching up with nearly a fortnight's post", Hubbard notes that he'll read the novel "at a sitting, because (as I'm sure he'll agree) that is the way one would like one's books to be read—apart from the probability that I shall not, as they say, be able to put it down." However, it's not one I'm very keen on myself, so you don't have even to say you like it. Crikey. Probably a good job the blurb was written by an (over) enthusiastic copywriter than by Hubbard himself, then. 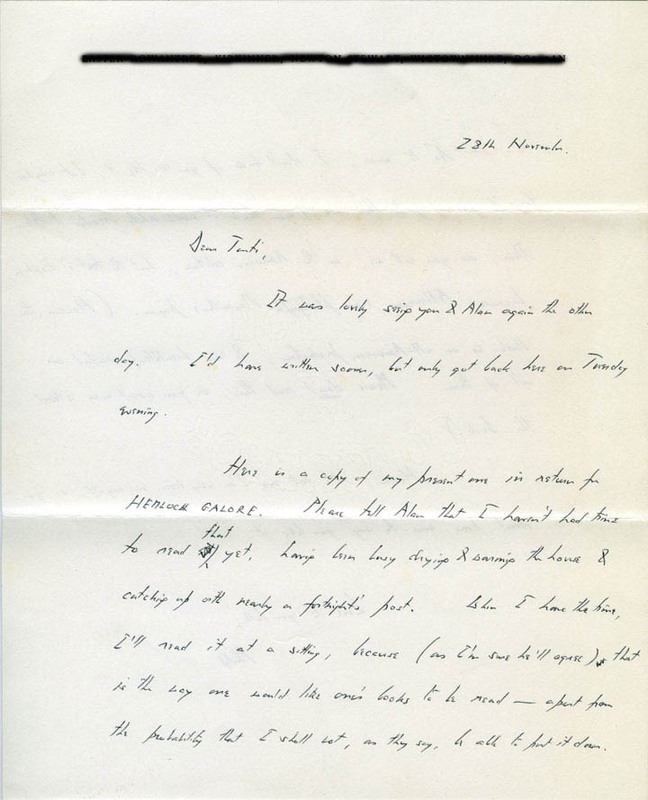 I've blacked out the full address at the top of the letter – the house may still be occupied – but it was sent from Wigtownshire in south west Scotland, where Hubbard moved to from Dorset in 1973 and lived until his death in 1980. 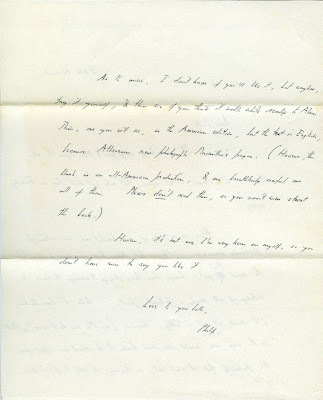 It's not the most detailed of letters – the Joseph Hone missive I found in a first edition of Hone's The Private Sector is perhaps more revealing – but it's still an intriguing insight into Hubbard's life and friendships, not to mention his own views on his novels. A clipping of a newspaper obituary for Hubbard. 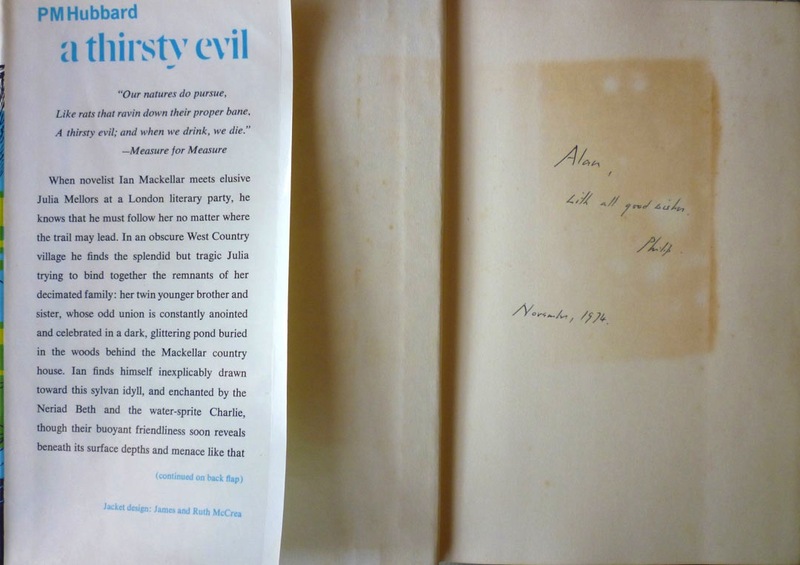 Presumably either Alan or Tonti Kennington inserted it in the book alongside the letter, and the whole lot went to a dealer upon either of their deaths (I bought the book from an AbeBooks seller, Anthony Spranger in Marlborough, near Swindon). And that brings us to the end of this run of P. M. Hubbard posts, although once again I will be returning to him down the line. 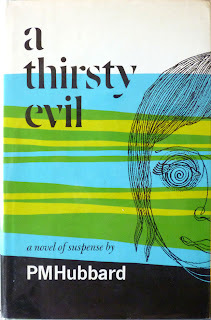 For our next Existential Ennui series, though, it's back to the spy fiction, with a British, female author who penned a handful of espionage and suspense thrillers in the 1950s before moving on to more literary concerns... First, however: this. 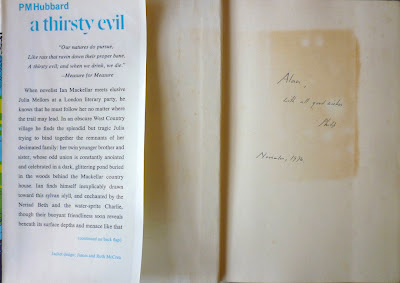 NB: Another piece of fascinating P. M. Hubbard ephemera to do with A Thirsty Evil can be found here. Amazing find! And now of course I must read at least a few of Kennington's evocatively titled books. Thanks for another tidbit of crime fiction esoterica. This was definitely worth the wait. Did you know you were getting this stuff when you bought the book or did these things fall out when you opened up the book? A thrilling find in any case. I like knowing that my American edition has the English text. Hemlock Galore and Young Man with a Scythe - can't wait to hear more about those. You might have a bit of a wait, BG: I can't see any readily available copies of either online. As to the ephemera, I knew there was a letter inside the book, but I had no idea what it was about, or to whom to was written. So yes: a good find! I haven't read it, but I probably will, given that Hubbard seems to have been interested in him (though he might have been just politely following up a chance acquaintance). Very interested, polecat, and very interesting. Thank you for that. I must say I'm intrigued to try one of Kennington's novels myself, but let me know how you get on with Hemlock Galore. Better late than never. I've found two of Kennington's books! Amazingly, one was in my local branch of the CPL: Young Man with a Scythe. And I managed to find and purchase a cheap paperback copy of Bagful of Bones though an online bookseller in Brooklyn, NY. Apparently it was the only one for sale. (The one currently listed at abebooks.com is the one I bought, BTW, so don't bother.) Reviews soon to follow at my blog. Good work, John! Look forward to your reviews. I've so many books to read I'm trying not to investigate too many "new" authors now, so Kennington was quite far down my list. But I'll be interested to see what you think... and if he turns out to be good, I'll probably embark on a feverish hunt myself!